There is much to learn about the garden: the planting, the weeding, the pruning, what to grow, plus all those plant names. One of the more enjoyable aspects of what a garden teaches is how the garden gives back. 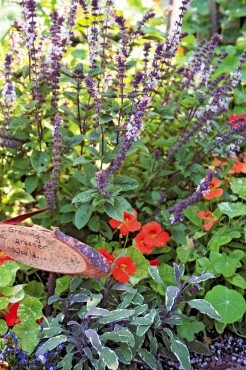 A gifting garden is all about growing useful plants — varieties that are harvested and preserved to make creative recipes and crafts to give as gifts. 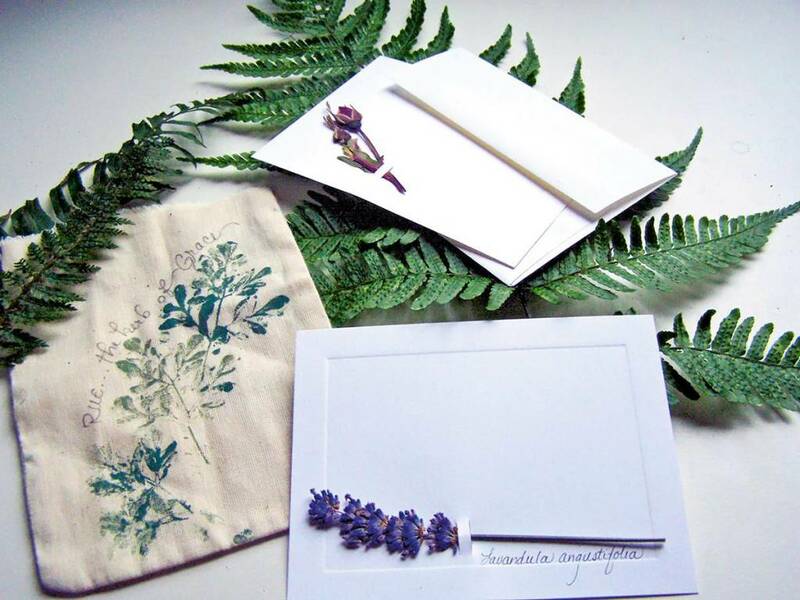 From herbal spice mixes and tea blends, to pressed note cards, there are many ways to create gifts from the garden that are unique and add a personal touch to gifting. Growing plants specifically for creating gifts will also add a new learning dimension with the exploration of plant uses for flavor, fragrance and crafting. Herbs are some of the most valuable plants to harvest; many are heavy in flavor and fragrance that remains through the drying process. Easy to grow, abundant producing herbs like oregano, sage, rosemary and thyme are used for herbal seasoning mixes. Mints, stevia, lemon verbena and lavender blossoms dry well for use in specialty tea blends. Herbs well-known for healing like lavender, rosemary, calendula and chamomile are great for soothing bath salts and tub teas. 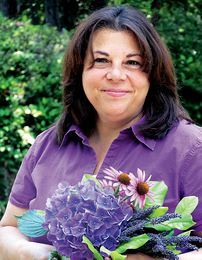 Plants beyond the category of herbs, harvested for gift creations, include fruiting plants such as raspberries, blueberries and strawberries. The fruits can be dehydrated for flavorful additions to homemade granola mixes. Delicate flowers such as pansies, larkspur, bleeding hearts and violas are pressed for botanical pictures, note cards and handmade journals. Drying: Herb fragrance and flavor comes from the precious essential oils in leaves. The timing of harvest is important; herb leaves and stems are most flavorful and fragrant in the morning after the dew dries. Harvest stems with leaves and/or flowers attached, tie in loose bundles and hang to dry. A good drying space needs to be warm and dry, with no sunlight. Hang bundles from rafters, drying racks or screens, positioning them where air can circulate around. When plants are “cornflake” dry, strip the leaves off the stems and store in glass jars. Store whole leaves for most uses like teas and bath preparations. Don’t forget to label your harvest; most herbs look alike after they are dried. Pressed flowers: Create note card sets and handmade journal covers with flowers form the garden. Pressing: Pick flowers for pressing after the dew has dried and, if possible, after a spell of dry weather. Press immediately after picking for the best quality. 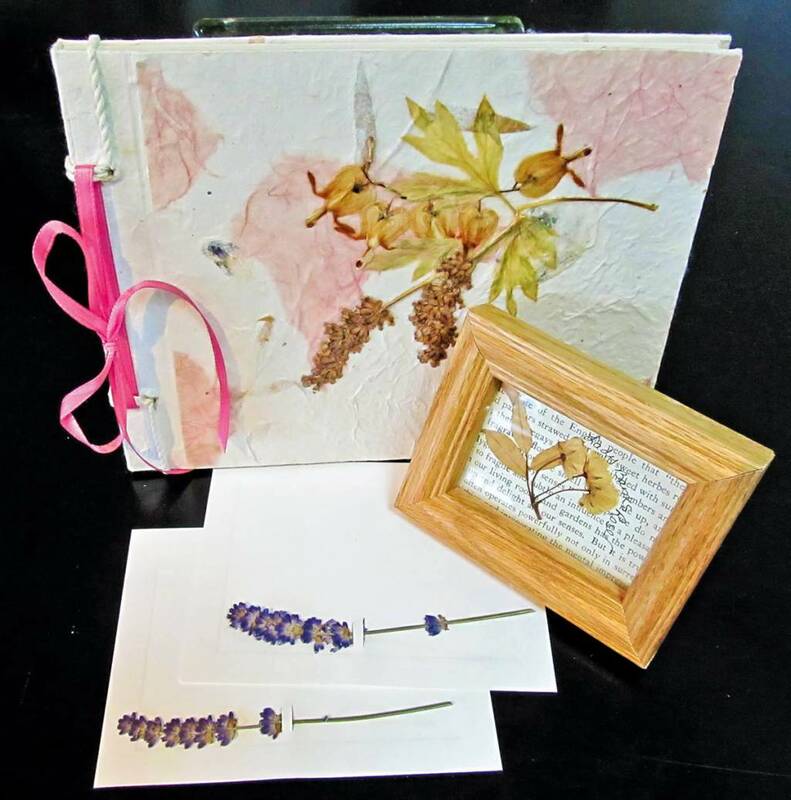 Supplies for pressing include blank newsprint or sheets of paper, a flower press, heavy-weight books or a cinder block. Lay flowers on the blank newsprint. Don’t allow plants to touch. Lay some flowers in profile or flat to get the maximum show. 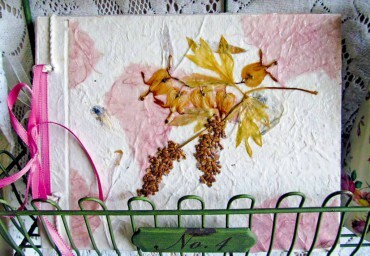 Cover the flowers with a blank piece of newsprint or paper. 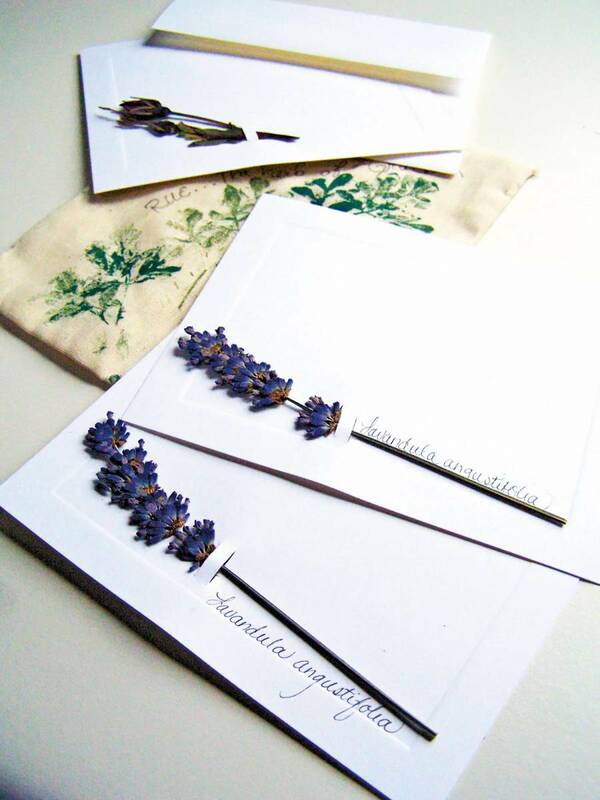 Place the flower/papers between the press, layering newspapers to help absorb moisture. The best results are achieved when the pressure is heavy and even. Check the pressed pages without disturbing the flowers after a few weeks; if the pages feel damp or cool to the touch, replace the newspaper between and continue to dry. Steeping: Steeping is a method that allows the flavor and fragrance of plants to blend into a liquid form. The most common steeping for preservation and gifting is herb-flavored vinegars (see side bar for recipe). You spend a lot of effort in growing and making gifts so take time to package them thoughtfully. Decorating possibilities are endless with beautiful papers and other snippets of decor available at craft stores. 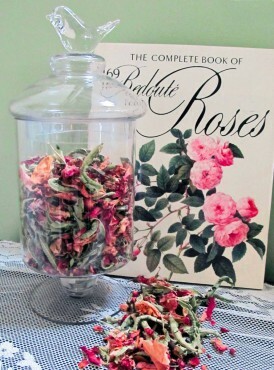 Coordinate colors or themes to the gift; for example, rose paper for rose petal potpourri sachets. Add a poem or verse that might be appropriate for an extra touch. Use ribbon and lace to tie around bottlenecks or fabric bags. Decorate bottles by rolling them in paper or covering with plant material. Label with recipes and instructions for use. You will find most of the expense will be in the packaging. Get creative: Scout vintage stores for lace scraps, doilies and unusual bottles and jars. When recycling old bottles, be sure to disinfect by cleaning in hot water, use a weak bleach solution if needed, rinse well and allow to completely dry. Gently wash herbs if needed; remove any discolored or damaged leaves. Allow to air dry. Pack in a sterilized glass jar. Pour vinegar over the herbs. Gently crush herbs with a wooden spoon to bruise them and release flavorful essential oils. Cover the jar with plastic wrap and screw on lid. Let the mix stand in a sunny window or warm place for about 10 days. Taste the vinegar after this time, add more herbs if a stronger flavor is needed, or add vinegar to tone it down if flavor is undesirably strong. 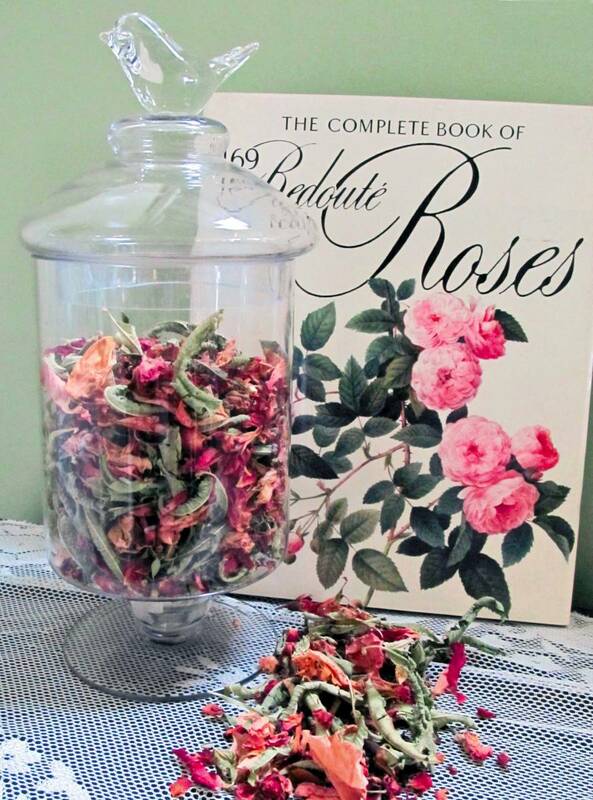 Potpourri: Collect rose petals from fragrant, red roses and add to other dried leaves and flowers to create a dried potpourri for elegant, aromatic mixes to give. When your creation is finished, strain out the used herbs. Pour the vinegar into a decorative bottle, add fresh sprigs of herbs, seal and label. 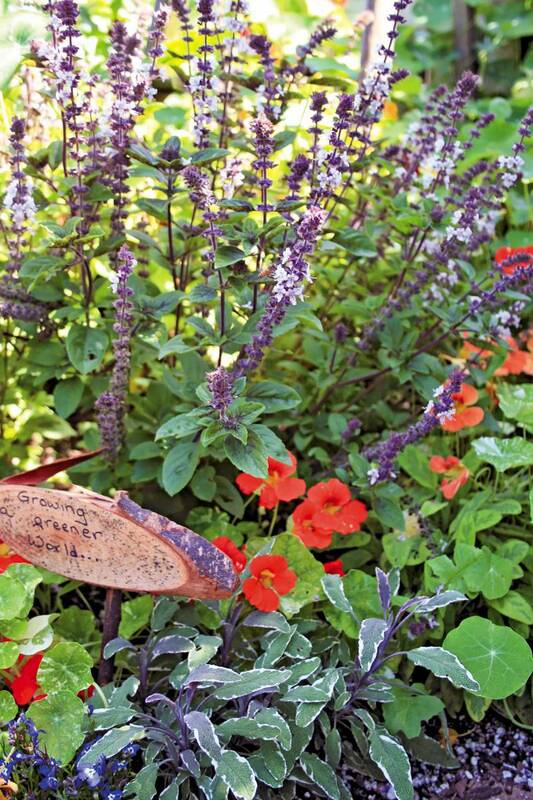 Use a terra cotta pot and fill with hand-bended bath salt, fabric sachets and other herbal-inspired spa treatments. 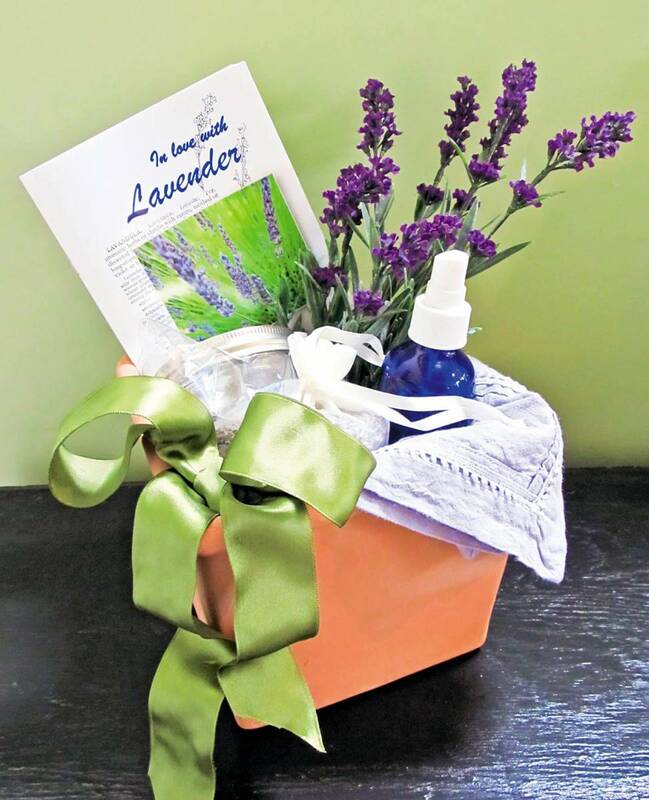 Pick an herbal theme for the basket like lavender for relaxation or peppermint for foot spa treatments. Add extras like a wash cloth, books and candles. Combine ingredients well. For a finer blend, ingredients can be ground together. Place in a muslin bag. To use: Place mix in a warm bath. Bathe for a minimum of 15 minutes to capture the full benefits of the herbs. 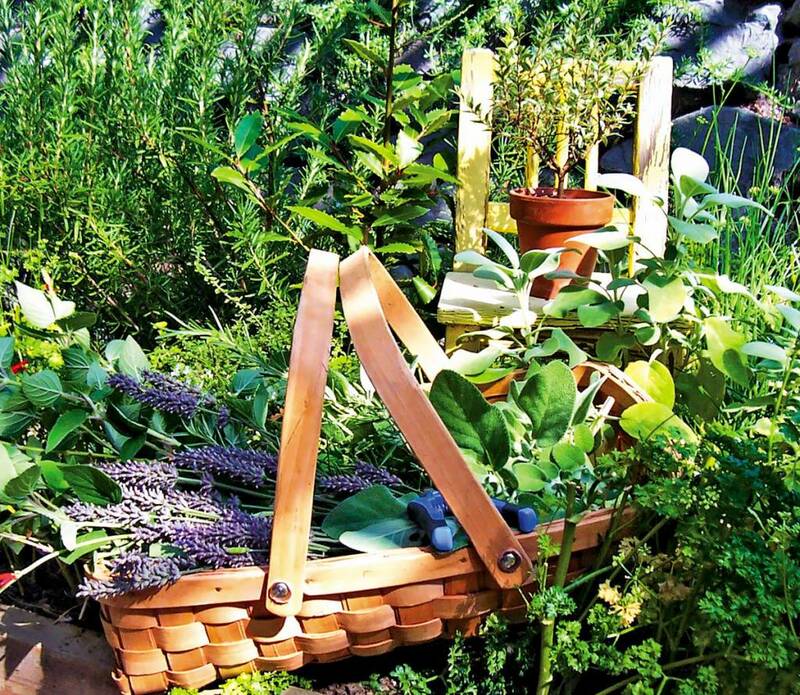 One of the more enjoyable aspects of what a garden teaches is how the garden gives back. For the sweet tooth on your list, create a mini selection of herb-infused sugars. Wrap up in a gift box and include a recipe book or cards sharing how to use them. Herbal sugars are perfect to sweeten tea or to sprinkle on the top of shortbread or scones, or swirl the rim of a cocktail glass with mint sugar. Use small, decorative glass jars that seal tight. 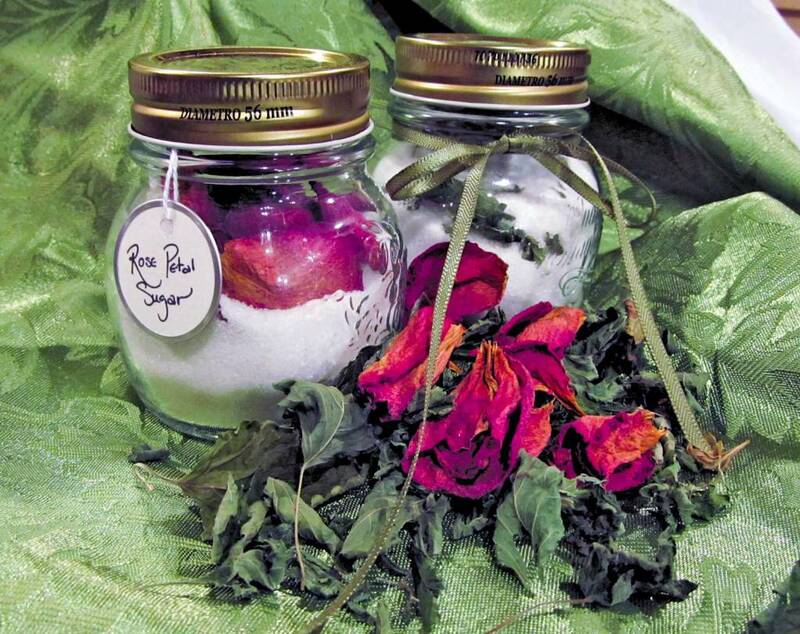 Alternate a layer of sugar and the chosen herb (use peppermint or spearmint leaves, rose-scented geranium, lavender buds, rose petals, lemon verbena leaves, vanilla beans or ginger) until the jar is full. Let sit a few days before use to allow the flavor to infuse through the sugar. Gift package with a tea cup, shortbread cookies, a jar of honey and a personal sentiment, plus inspirations that slow the pace and relax with a cup of tea, like a good book to read. Experiment with flavors you like; try not to add more than three ingredients at a time. Herbs mixed with Indian or China teas: Create flavorful blends from purchased bulk teas. 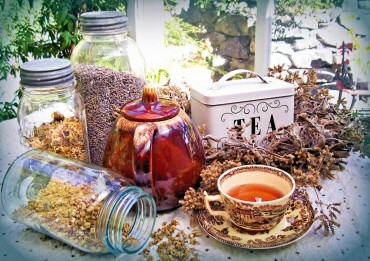 Mix a single herb with bulk tea such as Darjeeling, green or earl gray. 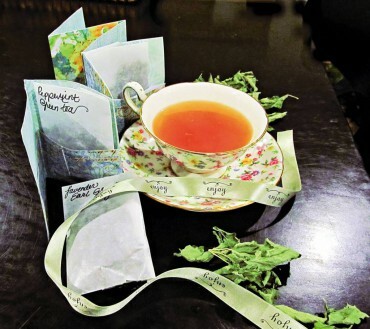 The homegrown herb will enhance the tea with flavor and fragrance. Begin by mixing the tea 4 parts to 1 part of dried herb. Combinations to try: English lavender buds with earl gray, spearmint with green tea or bee balm (Monarda) with Darjeeling. Package hand-blended loose teas in small glassine bags. Seal and label with the flavor and instructions on how to brew. To use: 1 teaspoon of loose herbs per cup of hot water. 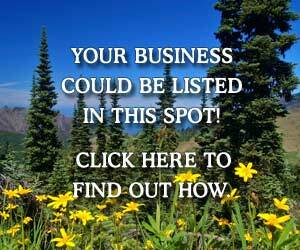 This article was first published in the Winter of 2012 print edition of the WestSound Home & Garden. Any discrepancies, omissions, or inclusions that seem incorrect are purely due to the age of this article. WestSound Home & Garden deemed this article useful and beneficial as a contribution to today's readership, and therefore is included in this site's online article archives. 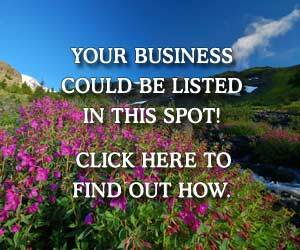 If you feel the content of this article is detrimental due to its age, please feel free to contact us to request removal or modification.